At this time of year we always start looking through the freezers (there are 3 here) to shift some of the food that has been put there last summer. We want to make sure we make use of the harvest from last year, as well as make sure that we have room to put the fresh food that will be coming in a few months. We also need to butcher some meat for the next year before the weather gets warm, but we need to get some space in the freezers first. Does your freezer have a whole lot of mystery items at the back or down the bottom? Ours do… I went through them on Saturday afternoon and found 2 different frozen garlic breads, 2 open packets of grated cheese, as well as several unidentified cuts of meat – though to be fair, butchering our own meat means that there are often a few unidentified cuts of meat (I’m not a much of a butcher). I also found a whole lot of random vegetables and several bags of mulberries, blackberries, and raspberries that we had frozen last summer. Once I found those berries, my thought immediately turned to what dessert to make them into, because Sunday isn’t complete without a delicious dessert. Ten minutes spent on Pinterest, and I decided that I would try a clafoutis. It’s something I’ve often seen, but never really made. It turns out that it is super easy, and super delicious. When summer comes around, I’ll be making this with peaches and apricots as well as fresh berries! A light, fruity dessert. Use stone fruit instead if you wish. Grease a 30cm ceramic flan pan. Spoon the extra two tablespoons of sugar into the flan pan and run it around so that the sugar coats the entire pan. 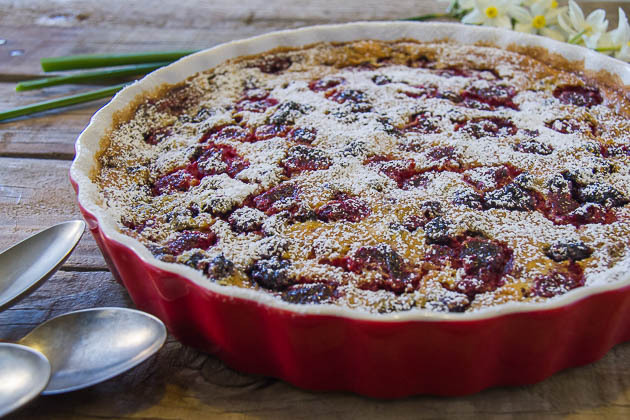 Place ⅔ of the berries into the flan tin to evenly cover the base. Beat the eggs together with the ⅓ c sugar and vanilla until thick and creamy. Mix in the cream and milk. Pour the mixture over the berries into flan tin. Place the remaining berries on top of the mixture, allowing them to sink in a little. Previous Post: « Plan Your Summer Garden Now! I love cleaning out the freezer. We have one full draw of our freezer full of broccoli. Slowly working my way through it. Would prefer to have berries in the freezer though. 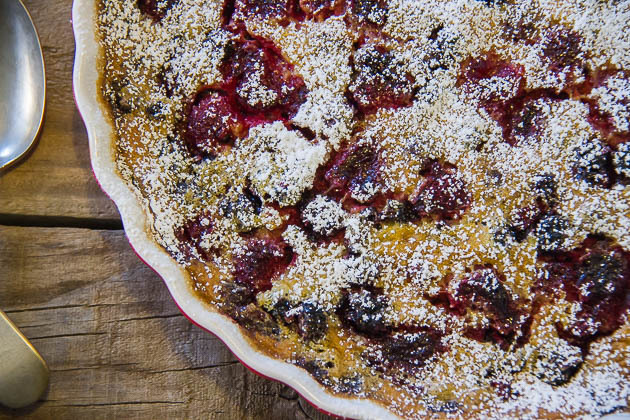 Your Clafoutis looks great, I bet it went down perfectly at church. I keep our freezer at the bare minimum if I can. I hate going through mystery blocks of things! 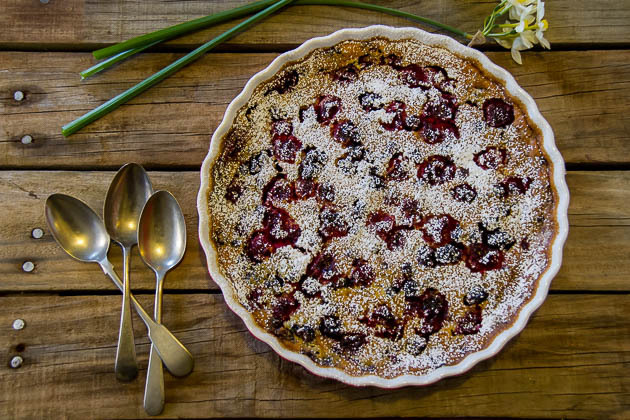 But sometimes those unidentifiable packages can lead to gold, just like this gorgeous clafoutis. I’ll have to put it on the dessert menu soon! That is a win if they are still good! This looks so amazingly delicious and begging for a hot cup of tea to go with it. I can never imagine any berries being lost in the back of my freezer, they are too loved to go missing for long. Looks delicious Jo. I must say my freezer is looking a bit bare. Its probably been full these last 9 months or so. Time for a top up. I understand your comments about freezers. It does not happen here now as I am by myself and just have the freezer in fridge. However, I did make a determined effort to empty it a couple of months ago. When my sons were growing up we had two big freezers and I used to bottle (Vacola) hundreds of jars of fruit every year. Many jars of jam too. These days I confine myself to pickles and sauces which I will eat by myself. You can use frozen fruit for jam.